The key to this play is recognizing how the Cornerback plays Red and Blue. If he drops into coverage and sticks with Blue, then Green will be wide open underneath. However, if the defense is playing a more traditional zone and the Cornerback stays home (covers Green). Then once the Safety turns to run with Red, the Quarterback can hit Blue for a big play. A variation of this play would be for both Blue and Green to Hook at about 5 yards. This will allow Red more time to clear out the Safety. Once they hook up, they should get back into the original routes. This is almost a stop & go type route except the goal is to just give Red more time, not necessarily to have the Cornerback bite on either route. One disadvantage to doing this is that the play needs more time to develop. 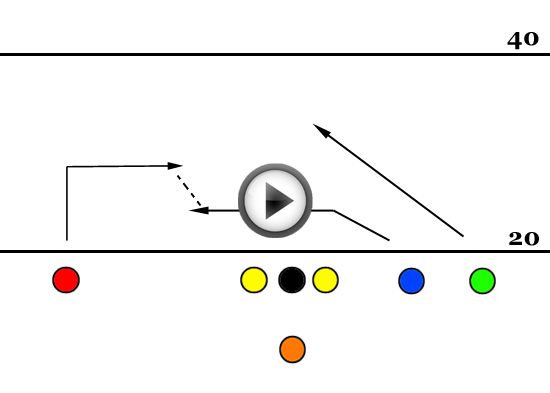 The goal of the Lineman Leak play is to hit either your Guard (Yellow) or Center (Black) for some quick short yardage. If the defense completely breaks down, Black can pick up some decent yardage. Red and Blue both sprint out with the purpose of occupying the Safety and possibly the Cornerback. If the Cornerback bails (most likely playing man-to-man), then Yellow will be the best option. If the Cornerback stays (Cover 2), then he will end up covering Yellow. With the safety occupied over the top by either Red or Blue, the play is to hit Black with pass.This is a simple play. However, with both the Lineman and Center going out for passes, the Quarterback will be under pressure quickly. If he can make the first Rusher miss, a big play can be had. One option for the Quarterback would be to immediately roll to the left after the snap. This may buy some additional time. 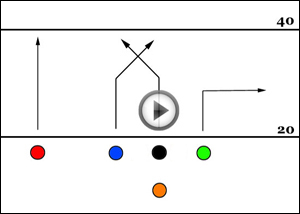 This trick flag football play can be effective, however, it requires great timing. The goal is for the Cornerback and Safety to both pursue Red hard once the ball is caught. As they are closing in, Red flips the ball to Blue and it’s off to the races. I’ve found that this play usually works better against teams that play better defense. The reason is that against below average defenses, the Cornerback may not pursue Red as aggressively as a better defense would. 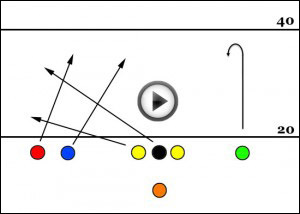 This play also works using any of the Lineman receiving the pitch. Though for most teams, a Lineman may not be the speediest choice. This is an all or nothing type of play. The goal with this play is to get the Safety to commit to Black or Blue. Once committed, the other Receiver should be open. The pitfalls of this play is that it takes more time to develop and the Quarterback will most likely need to shake the rush at least once before getting the pass off. Some variations of this play would be to vary the routes of Red and Green. One modification is to have Red run a hook. This will keep the Cornerback tight and allow Black to get deep. Another option is to have Black run a slant to the left under Blue’s route. This will force the Safety to cover Blue and get Black out quicker. However, the Cornerback may see this route and peel off Red and pick up Black. This is a standard play in 4 man flag football. The purpose is to catch the defense playing a zone and overload the Safety. With the safety forced into a decision, neither outcome is generally good for the defense. One variation would be for Blue to run a short Hook In or Cross In (about 3-5 yards). Red can flatten the post portion of the route to about a 30° angle. The plan with this variation is that the Safety will cover Black. One Cornerback will be occupied with Blue. 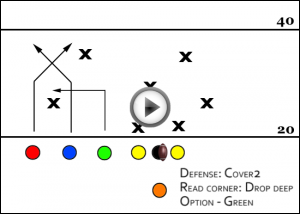 Most times, the Cornerback covering Red will play outside, forcing Red inside. When Red flattens the route, the Cornerback will be in chase mode the whole time. 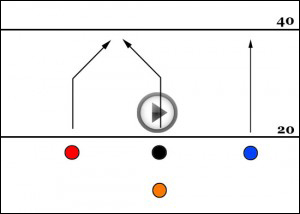 Why Use Flag Football Plays? Many teams go into a game relying on their athletic ability and skill in hopes that this will be enough to beat their opponent. If you team has superior talent, many times, this will work. However, every league has a those teams that don’t have the fastest players or the Quarterback with the best arm. Yet, somehow these teams seem to win on a consistent basis. They may not win the Championship every year, but come playoff time, they are in the running. One advantage that sets this team apart from the others is that they utilize a playbook with flag football plays that work based on their talent level. You don’t need 100s of plays to make your team successful. Many teams only have 10 plays with a few extras for special situations. The goal of any team using a playbook should not be to have many plays that they are only good at. The goal should be to have a handful of plays that they use week in and week out. Plays that they become very efficient at running. The only thing that stops them from scoring is dropped passes or the occasional sack.